Diversities of all kinds are in the South Loop between September 13, 2012 and April 6, 2013. The Dance Center of Columbia College Chicago’s next season lineup, which includes per usual a variety of related discussions, master classes and family matinees, features for example an intersection between Butoh, African dance and architecture; and the beginnings of a Grotowski-influenced physical theater cycle inspired by Marc Chagall. Single tickets and subscriptions are available starting July 9. The work of five independent female choreographers from Africa comprises a kind of mini festival September 13–15, “Voices of Strength.” See Correspondances by Haitian-Malian artist Kettly Noel and South African dancemaker Nelisiwe Xaba, Sombra by Maria Helena Pinto of Mozambique, Quartiers Libres by Nadia Beugre of Cote d’Ivoire, and Madame Plaza by Morocco’s Bouchra Ouizguen. That’s followed by (glowing) September 27–29, the aforementioned Butafritectural bonanza, presented by New York’s Kota Yamazaki/Fluid hug-hug. 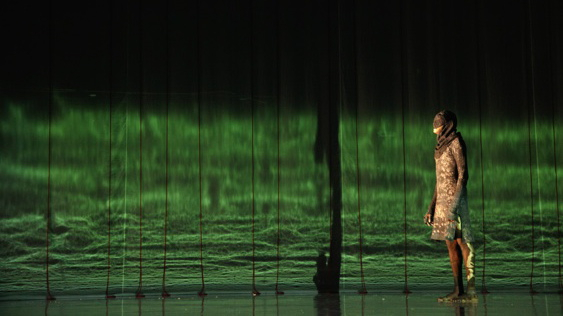 The work’s six dancers are American, Ethiopian, Japanese-American and Senegalese and its score is by Koji Setoh. Gallim Dance comes to town October 11–13. The NYC ensemble performs choreography by Andrea Miller, seen recently at the Dance Center performed by Ballet Hispanico and in repertory at Hedwig Dances. Gallim’s Chicago show will be one of two full-lengths, Blush (2009) or Wonderland (2010), to be decided. The Seldoms, from Chicago and on a roll, follow October 25–27. An evening-length work, title TK, by Carrie Hanson continues her choreographic interest in current events, exemplified by last year’s Stupormarket and February’s This Is Not A Dance Concert. It’s the Seldoms’ 10th year and fellow local group the Chicago Moving Company’s 40th; the latter presents a new work by Nana Shineflug plus four revivals, from 1984–2001, March 21–23. It’s been more than a decade since Stephen Petronio Company last played Chicago; the New York group ends its absence March 7–9 with Underland, created in 2003 to music by Nick Cave. Closing the season April 4–6 is the return of Mexico’s Delfos Danza Contemporánea, memorable in its local debut (in the same space) in April 2009. For further details, visit the Dance Center site or call 312-369-8330.